Max Missel was born October 18, 1895 in Kovno, Russia (now Kaunas, Lithuania). Five-year old Max came to the United States with his mother Lipsa and his brother Harry in 1900 or 1901 (exact date not determined). They came to join Max’s older brothers John, Samuel, and Abraham who had already established themselves in Boston. The youngest of five sons, Max arrived as a Yiddish-speaking boy. He and his family were part of the wave of Jewish emigration from Eastern Europe in the late 19th and early 20th centuries. They left to escape religious persecution and to find a better life. By 1917, Max was a 22-year old telegraph operator working for Western Union in Boston. For reasons lost to history he moved to the west coast. By December of that year, he enlisted. Max was assigned to the 405th Telegraph Battalion, Signal Corps, Company D. The 405th trained at the newly-established Camp Lewis, near Tacoma, Washington. The history of the 405th is recounted in From Puget Sound to the Rhine: Being a Record of the 405th Telegraph Battalion, Signal Corps. Written “by and for the Enlisted Personnel of the Battalion,” the book describes in great detail the day-to-day life of the 405th. With the benefit of this book, it is possible to imagine the experience of Private First Class Missel. There was the physical exertion of hikes and drills at Camp Lewis, the stress and boredom of army life in the barracks, the excitement and exhaustion of travel, the rain, cold and heat of the countryside, and the reality of war. The Signal Corps mission was to construct and maintain lines of communication, “even under the most intense shell fire.” After a winter and spring of intense training, including instruction in trench and gas warfare, the 405th departed Tacoma for its long journey across the United States and “over there” to Europe. Max’s unit proceeded east from St. Nazaire to the town of Paliseau on the outskirts of Paris. There, “it was the important duty of Company D to construct ‘tout de suite’ lines of communication that would ensure uninterrupted and efficient service in the event of the fall of Paris.” Days and nights in Paliseau were punctuated by intense air raids and the sound of “Big Bertha” German artillery at frequent intervals. Continuing east, Company D proceeded to Neufchateau and Royaumieux. During these days, “Every man assisted in the digging of post-holes” – the duty being the essence of hard labor. Fortunately, there were opportunities for day trips to Paris for some of the men on leave. We have no record of whether Max was able to see the big city. As dawn broke the rain stopped and the St. Mihiel salient was in American hands. Telephone exchanges were quickly installed in Flirey, Essay, Nonsard, and Euvezin. These new exchanges were, at first, “directly back of the first lines and were almost daily under bombardment.” Activity was directed from a “big dugout” at Menil la Tour which served as the center of the battalions operations. General Pershing stopped in at the dugout during that first day of the drive. The 405th proceeded through Trier, Ruwer-Paulin, and Beltheim. The final leg of the journey would be through Coblenz, completing the transition from the Moselle to the Rhine. In Mayen, the men were billeted in a large schoolhouse. From here on, the enemy was influenza. Several soldiers were afflicted, and we have record of Max being sent to the hospital on March 13, 1919. We do not know if Max was suffering from the flu or some other malady. Winter and spring consisted of maintenance of communications as well as athletic contests and other recreational past-times. By May, it was time to return home via St. Nazaire. On June 2, the 405th boarded the USS Henderson, bound for Hoboken and Camp Merritt. June 24th was the official mustering out for all members of the 405th. Max elected to return to the west coast. Official documents record that he was honorably discharged at the Presidio in San Francisco on June 30, 1919. He was given $112.05 travel pay to Los Angeles. According to family lore, Max went back to work for Western Union. Years later he spoke frequently about his postwar days in San Luis Obispo, CA, Redding, CA, and Reno, NV. By 1927, he returned to Boston to marry Mary Stern. His daughter Lillian was born in 1928; daughter Helen was born in 1936. Upon returning to Boston, Max opened a grocery store on Glenville Avenue in Allston. He owned and operated the business with his wife Mary for over 30 years. For a man who traveled from Russia to the west coast, back to Europe, and up and down the west coast again – Max finally found home. Rarely traveling again, he seemed content to be at home and in his store, with his family, just off Commonwealth Avenue in Boston. 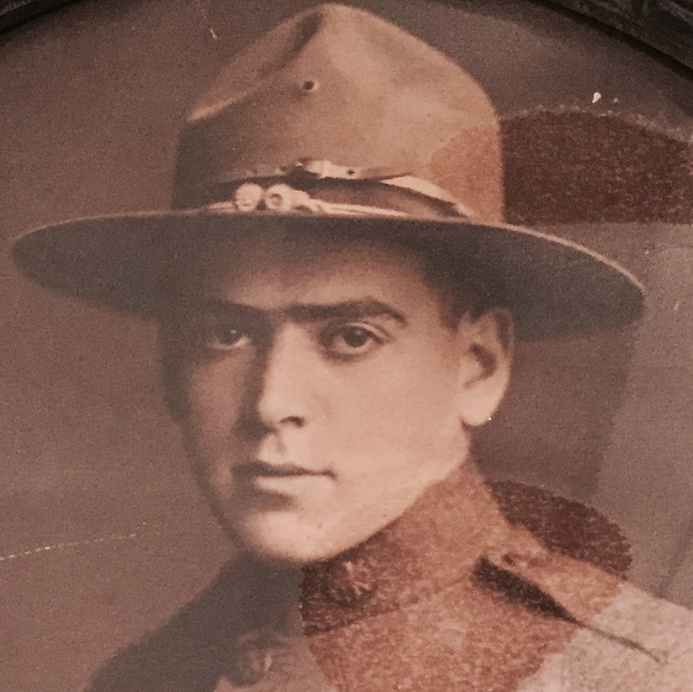 As he put it in his own words in From Puget Sound to the Rhine, “I didn’t have no guts when I joined the army, but I have sure got them now.” Max was a survivor, grateful for his life in the United States. With this humility came a genuine love of country, a sentiment he passed along to his children and grandchildren.